Would you make a good office clerk? Take our career test to find out how you match with this and over 800 other careers. What is an Office Clerk? What is the workplace of an Office Clerk like? An office clerk is someone who typically works in an office doing a little bit of everything; answering phones, bookkeeping, filing, mailing, message delivery, data processing, running errands, sorting mail etc. Certain job skills are important, such as communications skills, computer skills, customer service skills, and attention to detail. Office clerks need a variety of general office skills - the ability to file, make photocopies, post outgoing mail, complete banking transactions, sort and distribute incoming mail, sign for deliveries and send faxes. They must also be able to keep accurate paper and electronic records, and take detailed phone messages. 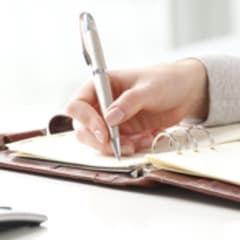 In some offices, office clerks take dictation at meetings and transcribe notes, as well as keep track of office supplies and replenish them when necessary. In some office settings, office clerks may take on more advanced tasks, such as keeping records for payroll, making out paycheques, or taking inventory. If an office clerk is asked to supervise other employees, previous managerial experience is usually needed. The specific duties assigned to office clerks can vary depending on the type of office in which they work. An office clerk at a university may process application materials or answer questions from prospective students, whereas an office clerk at a hospital may file and retrieve medical records. Are you suited to be an office clerk? Office clerks have distinct personalities. They tend to be conventional individuals, which means they’re conscientious and conservative. They are logical, efficient, orderly, and organized. Some of them are also enterprising, meaning they’re adventurous, ambitious, assertive, extroverted, energetic, enthusiastic, confident, and optimistic. Does this sound like you? Take our free career test to find out if becoming an office clerk is right for you. Office clerks typically work in comfortable office settings. They are found in nearly every industry; the most popular industries being educational services, health care and social assistance, waste management and remediation services, and government offices.